Thank you for your interest in Wide Modular Conveyor Belt Systems. We will be happy to discuss the pricing in more detail with you please fill in your details below and somebody will contcat you back with a quote. Alternatively please call us on 01772 690656 and please reference our part number - Wide Modular Conveyor Belt Systems. Wide and heavy duty modular belt conveyor systems suppliers and manufacturers. With 100’s of options based on different models, designs of belts, drives, stands and side guides manufactured and supplied to you on time. Wide bodies modular belt conveyors are extremely flexible and can take heavy weights. These conveyors provide a more stable conveying surface in some instances than PVC belt conveyors or roller conveyors. We offer an industry leading 10 year warranty on all Dorner conveyors. No other company in the industry offers a longer warranty. Terms and conditions apply. 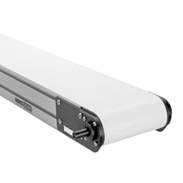 These conveyors can incline, decline and bend in one run from one drive. We can of course help you assess if this is the right system for you.